Everyone talks about having a good core stability, and about having great core muscles but few people really know what that entails. When we talk about Core strength, we are talking about much more than abdominal muscles or work with abdominal crunches, or strange exercises using a stability ball. We are talking about a stability unit, about a persons gravity center, about being able to balance our bodies without falling over. Nowadays lot’s of people do hundreds of different crunch exercises because they think they are exercising their core muscles and getting stronger. Most of the time when this happens people create an imbalance with a strong abdominal wall that can seem strong, but it is actually supported by a weak back and very weak core stabilisers (i.e. 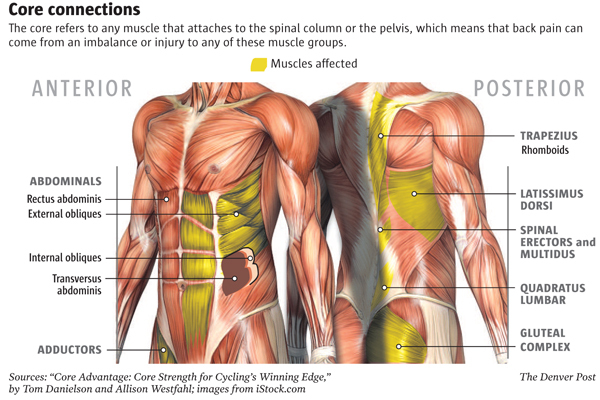 the muscles that you can’t see that actually provide the support you to remain upright). So, what are the muscles involved in our Core? The major muscles included in core strength are: the pelvic floor muscles, transversus abdominis, multifidus, internal and external obliques, rectus abdominis, erector spinae (sacrospinalis) especially the longissimus thoracis, and the diaphragm (used for breathing). Minor core muscles include the latissimus dorsi, gluteus maximus, and trapezius. These muscles are responsible for keeping our bodies well aligned as well as supporting all the structures that provide us with stability throughout our daily activities. To work your Core effectively you must start to understanding where your gravity centre lies, where you are distributing your body weight, and most of all you must balance and strengthen all the muscles involved, and not just focus on the aesthetics of the “six pack abs”. Artigo seguinte Já treinou outdoor?